Hat tip to Julius Suber. If you're human, you want a more humane Court, with "more humane" being the operative predicate. As example, Associate Supreme Court Justice Antonin Scalia has rhetorically opined concerning a supposed right of privacy, "Where is it in the Constitution? Show me where it is, I can't find it." And rhetorically I raise my hand, "I can, your honor." Ninth Amendment: "The enumeration in the Constitution of certain rights, shall not be construed to deny or disparage others retained by the people." 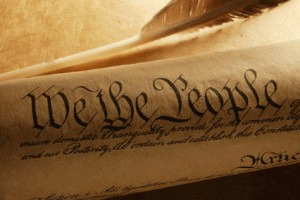 Tenth Amendment: " The powers not delegated to the United States by the Constitution, nor prohibited by it to the States, are reserved to the States respectively, or to the people." The first ten amendments, commonly known as the Bill of Rights, when first promulgated by a caucus of some of the fellows in Philadelphia, were not greeted enthusiastically by everyone in the convention. Many were anxious that at some point in the nation's history an ideological duffus, someone with Scalia's limited "strict constructionist" intellect, would come down the pike and insist - contrary to every electron of historical evidence about what the Founders sought - "if it ain't in there, it don't exist!" It was that fear they attempted to quiet with the last two amendments. I can't conjure how they could have done it any differently. And so it has been, from time to time, over the past 220+ years, we've been burdened by justices that prove there was legitimate substance to the Founder's fears. To all my "strict constructionist" friends (I don't really have any of that ilk, that was just me being sarcastic), I offer as evidence the amendments cited above, to argue that strict constructionism for our Constitution is an oxymoron. Or less prosaically, "Listen dummie: it ain't like Prego, it ain't in there!" Prior to college, I paid undue fealty to the sages of the ages. I was forever disabused of that erroneous presumption as immediately as I read Plato's Republic. He began with the attempt to define "justice." By the end of his brief treatise it was manifestly evident he had not only failed, but had failed miserably. What we got at the end was some meandering road map that led only to a dictatorship. The lesson learned was that neither I nor anyone else ought to expect greater proximity to authoritative wisdom than what can be found within our own breasts, that no one person or ideology will ever possess the "truth," and that Plato, 180-degrees removed from George Bush, who never debated himself, was closer to some of it when, in his Dialogues, he quoted Socrates, "The unexamined life is not worth living," and when St. Thomas Aquinas warned us to "Beware the man of one book." In a world and life of naught but vagueness, it's natural to look for crystalline clarity. That, however, is a fool's quest. It leads society to the raising up of despots and tyrants; Plato's carefully Petrie-dish cultured princes, being the only ones who truly offer it, and leaders like Hitler, Stalin, Pol Pot, Saddam Hussein, and the Taliban as some of the most recent and most tragic real life examples of it. Hopefully this lays to eternal rest the proposition that, with Justice Souter's announced retirement, President Obama will locate a perfect replacement candidate who is capable of dispensing perfect justice. The present federal judiciary, from the Supreme Court to the inferior courts around the country, has assumed a much too far to the right cast. This orientation, while satisfying those who identify along that continuum, is an absolute obstacle to any fair notion of fair justice. In support of this allegation I offer only the tortured legal logic behind Bush v. Gore and Lily Ledbetter v. Goodyear Tire and Rubber. In the former, the Court majority, as defense they even had a right to hear the case, a "political" matter no federal court had ever previously entertained and had ever previously eschewed as beyond its jurisdiction, claimed that to permit the lower court's finding for Albert Gore would "permanently harm George W. Bush." In the latter, the Court found against Ledbetter, a 19-year employee of the tire company who had been denied a lifetime of similar wages as those enjoyed by her male counterparts simply because she was a woman; a fact that Goodyear did not deny. The Court reversed every legal precedent that had insisted the tolling of the time in which a suit could be brought commenced with the moment a plaintiff first learned - or should/could have - of the alleged injustice, which in Ledbetter's case she did. In case after case after case, whenever the issue was one that would impact the daily lives of ordinary citizens, which I define as those below the upper 10% of economically advantaged, the federal courts, and the Supreme Court most particularly, have found for the corporations and the advantaged. When the issue would support a conservative white Republican orthodoxy and political superstructure, it has found for the conservative white Republican superstructure.